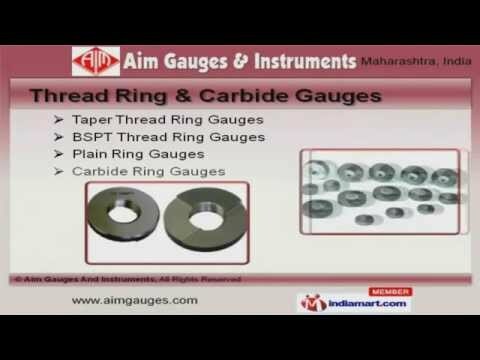 Welcome to Aim Gauges and Instruments, Manufacturer and Exporter of Gauges and Fixtures. An ISO 9001:2008 certified company, established in 2011 at Pune. Elaborate distribution network and Rigorous quality checks helps us to grab maximum customer satisfaction. Ashok Leyland Limited, Hero Honda Limited and KBL are some of our esteemed clients and we are backed by industry leading prices and Swift delivery of consignments. We offer a wide array of Snap Gauges, Setting Master, Measuring Pins and Wires. Thread, Plug and Snap Gauges are in huge demand across the global markets. Our organization is highly involved in providing an impeccable range of Thread Ring and Carbide Gauges. We also provide Setting Master, Measuring Pins and Wires at industry leading prices. Our Gauge Handles and Gauges for Automobiles are extremely reliable. We are offering a top notch quality range of Gauges for Testing and Thread Ring Gauges for Machines.